By Louise Phillips and Darren sherriff. A good way to spend an early morning in July. 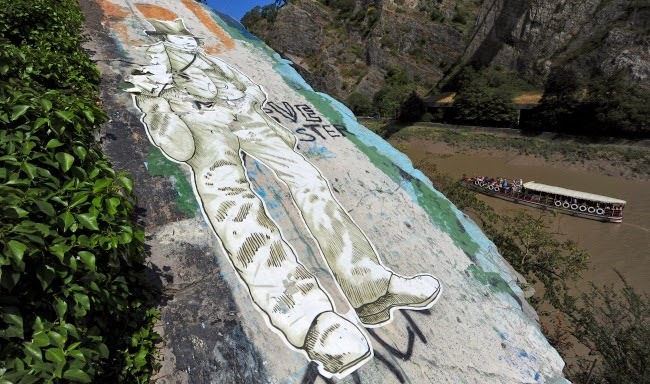 The artwork depicting the engineer Isambard Kingdom Brunel smoking a cigar has been created above the cycle path to Pill close to one of his masterpieces, Clifton Suspension Bridge. On its Facebook page, the Clifton Suspension Bridge Trust said: "Brunel has popped up beside the River Avon and is keeping a distant yet watchful eye on the bridge! "Follow the Avon Trail path along the river and as you skirt Leigh Woods you will see Brunel looking up at the bridge he described as his 'first child, my darling'." The trust has released a short video showing how the mural was created, as part of a project it dubbed ‘Operation IKB’. 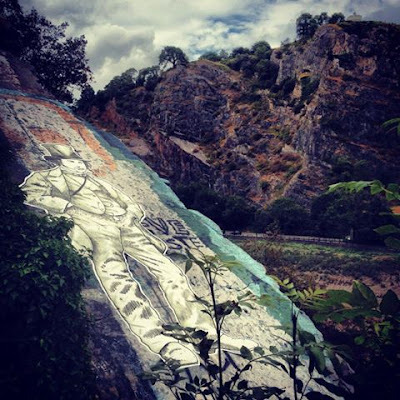 The film, which can be viewed at the Bristol Post website, shows two artists dressed in Brunel-style top hats creating the image on the rock face. They arrive on bikes with their materials and use a decoupage-style technique to paste the black and white mural onto the stone. 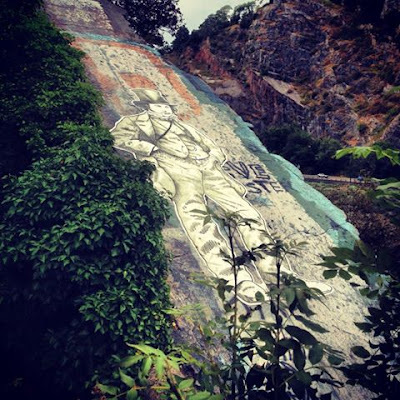 It shows the mural partly covering graffiti tags previously blighting the rock face and ends with the message ‘Find him looking upon the bridge he never saw’. The iconic Brunel-designed suspension bridge opened in 1864, five years after the world-renowned engineer’s death in 1859. In 1831, an attempt to build Brunel's design was stopped by the Bristol riots, and the revised version of his designs was built after his passing. Today the grade I-listed bridge, which is suspended by 81 matching vertical wrought-iron rods, is Bristol’s known landmark. It was used for the first modern bungee jump in 1979, formed the backdrop for the last ever Concorde flight in 2003 and was used as a handover point for the Olympic Torch relay last year. People living in Bristol have responded positively to the new mural. On the bridge trust’s Facebook page, dozens of people have ‘liked’ the artwork. Nick Gillett said: "So many things we owe great gratitude to Mr Brunel for in this great city of ours alone. Don't forget his GWR standardised global time." Alexandra Burns said "Love this!! Best bridge in the world !" while Tracie Keylock simply said "Awesome". On the Bristol Post website, JoeKingswood: "That’s much better than the usual graffiti that is sprayed there."